Looks can be deceiving since you can't see the HUNDREDS of bulbs still under that mulch. 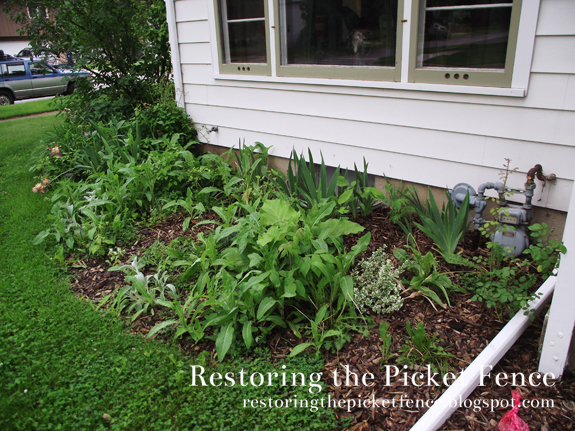 It's a little embarrassing, but our front flowerbed got completely neglected this spring. Yes, we were those neighbors. Do you see Big Brown Dog in the window? I was desperate to tidy this up, so J and I ordered flowers and grasses from Burgess. We ordered a TON of plants. Silly us, we were expecting a pallet of plants to be delivered. 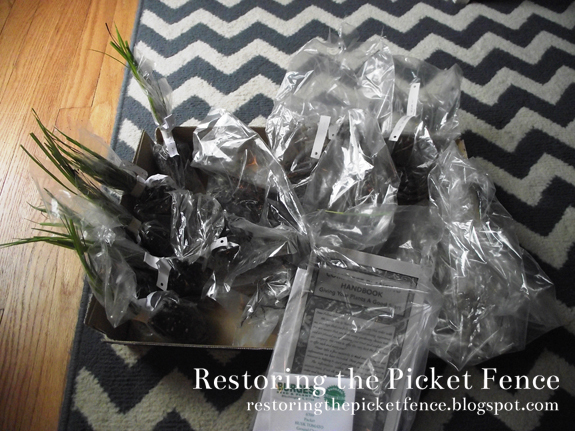 You can imagine my shock when we received a plastic bag in the mail containing tiny bags of roots, tubers and bulbs. This is not a bag of drugs, I swear. 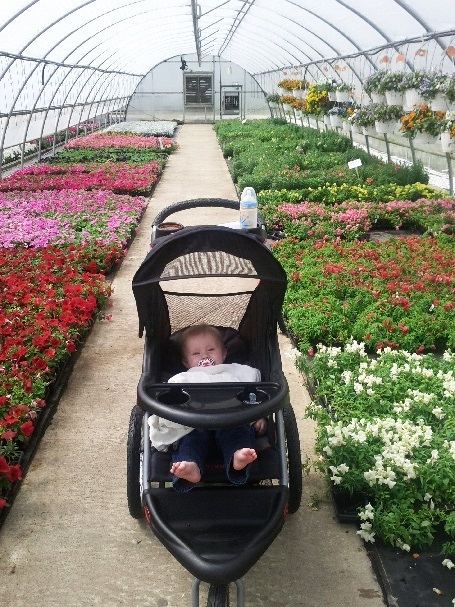 Seeing as how the above package of plants wouldn't fill in the flowerbed, we took a day trip to Woldhuis Farms. It was gorgeous there! It'd be a lovely place to tailgate if you brought a picnic lunch. Even Baby Z had a good time! 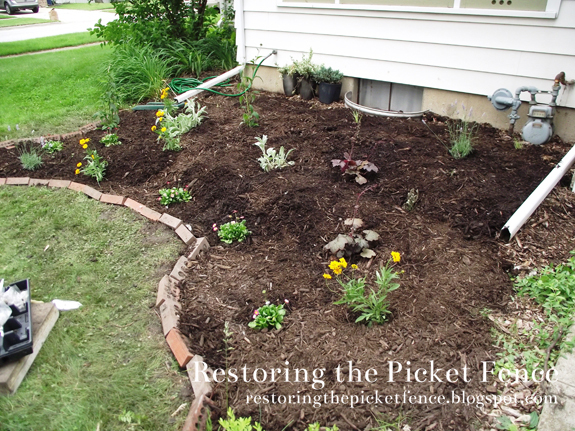 J fought the rain and was able to dig up the front flowerbed and expand it. We used newspaper instead of landscaping fabric to save on the total cost. We did add the Burgess flowers in here as well, but they are harder to see. 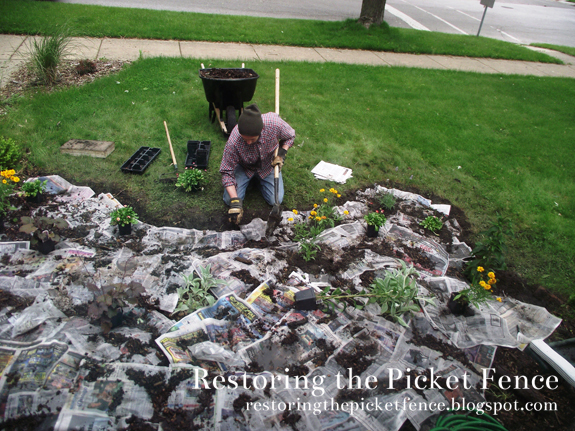 Use newspaper instead of landscaping fabric. The final product is lovely. The plants are still small, but they are all perennials that should do excellent in this area and mature into a lovely cottage garden. Do you have a favorite gardening tip for a newbie? You did the right thing by getting small plants. Yes, you get instant satisfaction with larger ones, however they can be a bit more susceptible to transplant shock. On a side note, I have a hosta from G and O's house, would you like a section? Ok, they need to wait until fall anyway. I am also getting rid of my daylilies... any interest? Hi! I'm Laura and I'm trying to live a more simple life.